Sometimes students will feel like they are drowning in the sea of life and need teachers to throw out a life preserver. Do Your Teachers Know How to Help Students in Crisis? People don't have to personally experience a crisis to feel it. 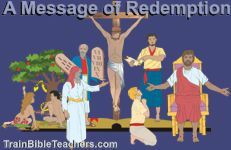 In this two page teacher training worksheet, Bible teachers take a look at God's solution and find some tips for helping their students turn to the Lord with their anxieties. Ministering to students with hurting hearts is different from helping people with physical needs. You can't simply put a Band-Aid on the heart and expect the feelings to go away. Practical assistance is not usually the answer. In this 6 page teacher training worksheet, Bible teachers will consider what kind of hurts their students might be experiencing and what kind of first aid to the heart needs to be applied.